This handsome backpack is hand-crafted by Chirada Loetparisanyu with cotton and leather. 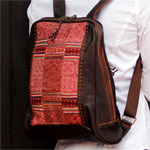 The front side is adorned with a handmade patchwork of woven, embroidered and stitched hill-tribe patterns. 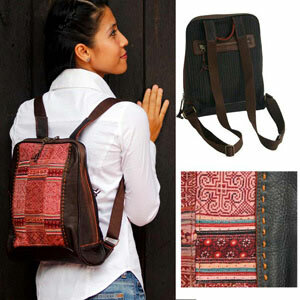 The back features a zipped pocket and a small handle to carry the bag by hand. The interior is lined in cotton, and features five inner pockets to keep things organized, two of them with zipper to secure small items. The bag itself closes with a zipper. The straps are adjustable. A stylish ethnic addition to enhance any contemporary outfit with class. Materials: Cotton 85% and leather 15% .